Morro Jable passenger and car ferry ticket prices, timetables, ticket reservations and information for ferries sailing from Morro Jable to Las Palmas and Santa Cruz de Tenerife. Compare all available Morro Jable ferry ticket prices in real time and book the cheapest available Morro Jable car and passenger ferry tickets sailing to and from Morro Jable, Las Palmas and Santa Cruz de Tenerife with Naviera Armas Ferry Line ferries online with instant confirmation. Book Morro Jable Ferry Tickets with Naviera Armas Ferry Line for ferries sailing from Morro Jable to Las Palmas and Santa Cruz de Tenerife online in advance to enjoy the cheapest available ferry ticket price. The price you see is the price you pay. There are no hidden extras or surprises such as added fuel surcharges or booking fees and we do not charge you anything extra for paying with a Visa Electron card. The price we quote you for your selected Morro Jable passenger or car ferry ticket, onboard accommodation and vehicle type is all you will pay, and that's a promise. To obtain a Morro Jable ferry ticket price and book your ferry ticket securely online please use the real time ferry booking form on the left. You are also able to add a hotel at your destination, or anywhere else, to your ferry ticket when completing your ferry ticket reservation. What was once a small fishing village with only 200 inhabitants, Morro Jable has now grown into one of the biggest holiday resorts for German tourists on the island (with around 8,000 inhabitants). It was during the early eighties that tourism first took off after the construction of the first Robinson club. Nowadays Morro Jable has something for everyone. The miles of golden beaches and clear blue seas, shops, bars and restaurants of attract thousands of tourists each year (at present there are around 16,000 beds). Despite all the tourism the old village still remains intact and there is a quaint harbour in the west of the town which is used by local fishermen and yachtsmen and you can still escape the hustle and bustle should you wish to take a leisurely walk along the promenade or check out one of the local beaches. Morro Jable lies at the southernmost point of Fuerteventura (approximately 90km from the Airport) and attracts a predominantly German clientèle. This large, modern, quiet and incredibly clean resort was originally a tiny fishing village. The bulk of the resort now stretches along the coast from the 'Old Town' northwards along a Palm-tree lined Avenue with Hotels and shops on one side and the Beach on the other. The original fishing village part of Morro Jable (the area around Plazoleta de Cirilo Lopez) has many Fish Restaurants and Cafés and is right on the water's edge. The Centro Comercial de Jandia on the main Avenue has several Bars and Discos upstairs, though these can also be very quiet especially in low season. There are two very pleasant beaches in Morro Jable, the 'Playa de la Cebada' in the Old Town is quite sheltered and the sea is normally very calm here (although beware the sudden gusts of wind that come down from the Mountains) and the shallow waters mean that the water temperatures are very pleasant and safe for bathing. Also along these beaches are several Bar/Cafés where you can cool down. At the western edge of Morro Jable is a modern Harbour where you can find several companies offering Marine Excursions and Ferry Services to Las Palmas in Gran Canaria. Some of the beaches here are the longest and most beautiful in the Canary Islands stretching 35km and there's plenty to do for the water sports enthusiast from jet skiing to windsurfing. Its also possible to take a jet foil from here over to the neighboring island of Gran Canaria. Morro Jable continues to grow each year spreading further afield (as do many of the main resorts on Fuerteventura) and a new marina is also being planned for the future. More staid than its northern counterpart, Corralejo (even if you wanted roast beef and Yorkshire pud you’d be hard pushed to find it), Morro Jable is almost exclusively German. The beach is the main attraction, stretching for around 2km from the older part of town and fronted by low-rise, immaculately landscaped apartments and hotels. Back from the beach, the charm palls somewhat with a dual carriageway lined with commercial centres and hotels. Best Price Guarantee - We always offer you our lowest available Naviera Armas Ferry Line passenger and car ferries ticket price to and from Morro Jable. There are no hidden extras or surprises such as added fuel surcharges or booking fees and we also we do not charge you anything extra for paying with a Visa Electron card. The price we quote for your selected Morro Jable ferry ticket, onboard accommodation and vehicle type is all you will pay, and that's a promise! In the unlikely event you find the same all inclusive Morro Jable ferry ticket cheaper in the brochure of any other tour operator we promise that we will do our best to beat that price or offer you the choice of requesting a refund. 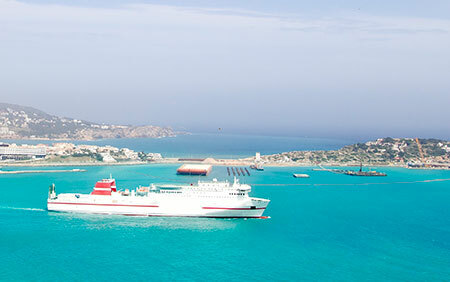 To book Morro Jable car and passenger ferry tickets please click here. At ferryto.com you are able to obtain live Morro Jable ferry ticket prices, check availability and book car and passenger ferry tickets to and from Morro Jable at our lowest available ticket price. Ferryto.com is part of the world's largest online ferry ticket distribution network providing the ability to book over 80 major European ferry operators including to Morro Jable and to over 1,200 other ferry routes throughout the UK, France, Spain, Ireland, Holland, Eastern Europe, the Mediterranean, the Baltic and North Africa.